UPS (uninterruptible power supplies) are used in areas where sensitive electrical loads must be reliably supplied with energy, e.g. computer and data centers, communictation systems, heating controls, medical equipment and production machinery. 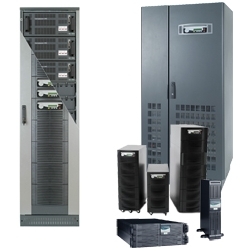 UPS systems can be switched between electrical consumers and mains power supply. This ensures always a 100% clean power supply. In case of power failure the batteries take over the power supply for 1 to 30 minutes or more, depending on the dimensioning of the system. During this time computers and processes can correctly shut down or it could be used to connect an emergency generator set. The modern MITTRONIK UPS systems are characterized by their low energy consumption and compact dimensions. The modular systems can be supplied from 0,5 to 6400 kVA. The parallel operation of several units enables higher performance. As mobile solutions for field use MITTRONIK offers UPS systems in special ISO containers. Together with container-generators and container-tanks this units could be used for mobile uninterruptible power supply systems. All models are classified according to the IEC 62040-3 as Class 1 (true Online double- oder continuous UPS).